Yup dual core Does Count with out the proper multiproc code it can't fully utilize both cores. Here's an interesting link that fits well in this thread. It makes me want to modify the rotating frame feature to include side views. This might be a goodie too to simulate ...2001CK32 ... The SMA and dist to Venus indicate this is another Trojan of our sister planet . As the other asteroid 2002VE68 this one comes also in the neighbourhood of earth , so is also under influence of our planet ...The asteroid is not really small , about 1 km in diameter . 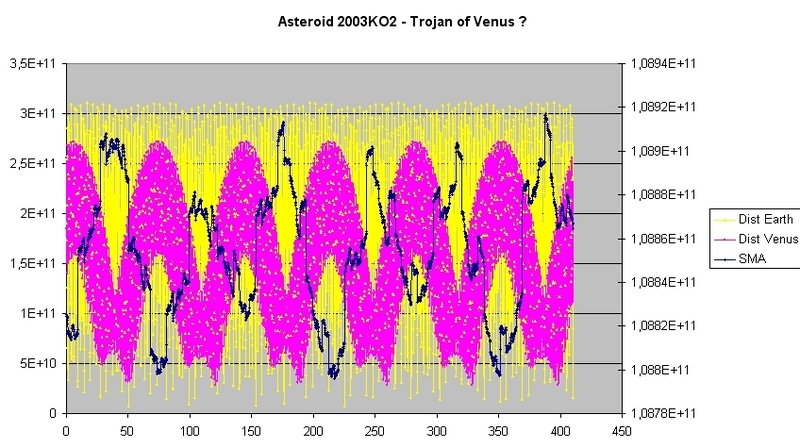 Maybe this is a third Trojan of Venus ...Asteroid 2003KO2... it's about 500 meters wide and has an inclination of ca 23° . The orbit is remarkable stable , in contrast to the other 2 asteroids above. That s perhaps somewhat surprising as the asteroid comes in his orbit much closer to earth than to Venus , as can be seen from the picture herunder . In the pictured timescale ( from 1/2/07 on ) the mean distance to earth was only about 20% bigger than the mean distance to venus . The ast 1999ND43 is rather big and has a SMA which is about the SMA of Mars ( thats how I identified it ) . The asteroid has an elliptical orbit which brings it in the neighbourhood of earth , meaning our earth has an influence on it . I forgot to append a link for Mars Trojans . I haven't tried your new Venus one yet, but I did try the Mars trojan. At a time step of 16K, it does have trojan behavior. And if you rotate the frame with the Earth's period, you can see exactly what is causing the sma jumps. It is in an imperfect 15:8 resonance with Earth. As one of the perihelion loops approaches Earth, the rate at which it approaches slows down, but not enough for Earth to reverse its direction. It crosses Earth and picks up speed again. It spends the majority of its time at the fast clip, and like a rubbernecker on the highway, it slows down every time it gets close to Earth. So the low sma's that don't last too long on your graph represent this. After running the Mars one a little longer, it may not be a trojan, but rather a horseshoe, similar to Earth's Cruithne. But I'm running at 16K, so I don't exactly trust my conclusions. I wish I had 10 computers ... When I finish playing around with VE68, I'll take a closer look at the Mars asteroid. I think I'll have to leave it running overnight to do justice to it. 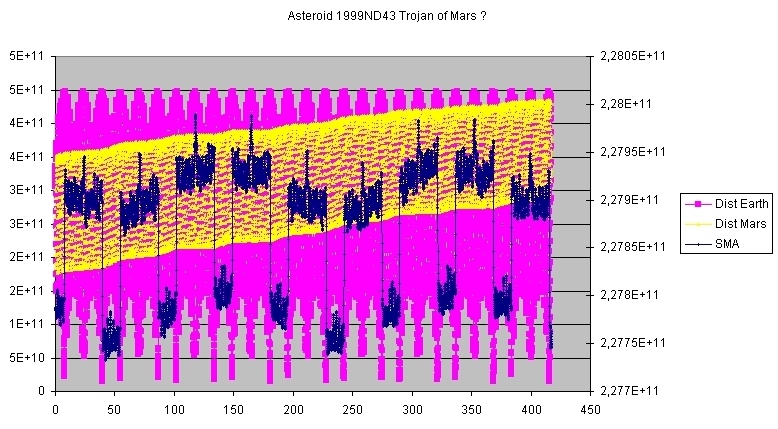 I think 1999ND43 is in a horseshoe orbit ( whats by the way the difference between a horseshoe and a trojan ? ) . It looks as if the asteroid is moving just a little bit faster than Mars . ( Tast/TMars <~1) . The distance to the planet increases with time , meaning it is getting further . When I saw this I thought : nopes , just a coorbital . After calculating the angle between them however it seems that the angle "pendles" between max and min , which indicates the asteroid may have an horseshoe . I think that the asteroid must now be "before" Mars as the angle increases and as the Ast is moving faster . This asteroid 2007AG ,discovered this year, might have an interesting orbit as it has almost the same period as venus buth also crosses mercury and earth . An example af an asteroid squeezed between three worlds . It has an elevated orbit , almost co-orbital with Venus which brings him close to earth and even much closer to mercury . The asteroid is definitivly influenced by both other planets .This becomes clear from the pictures below . Around the year 800 (+2007) it makes some close passes to mercury , changing its orbit ( speeding it up ) . Between the year 1000-1100 some close flybys with earth slow it down again . In the meantime the asteroid seems to orbit an horseshoe around venus . Those little 100 year cycles in the beginning are from an 18:11 mean-motion resonance with Earth. Here's 300 years of animation in a rotating frame set to Earth's period. Based on your graph, it looks like it breaks the resonance after about 800 years. I'm starting to get the sense that these temporary mean-motion resonances protect Earth from getting hit more often. I wonder If there is also a resonance to venus after 1000 years ?